A private home for a hotel person. Real estate developer and hotelier Tim Harrington is responsible, with his business partners, for nine upscale hotels and inns in the Kennebunk area. Their properties include luxury bungalows in the woods; bright, chic rooms at Goose Rocks Beach; a New England inn; and elegant, European-style accommodations: Hidden Pond, the Tides Beach Club, the Kennebunkport Inn, and the Grand Hotel respectively. So where does the Miami-based Harrington rest his weary head when he is in town? The answer has changed in the 29 years that Harrington has been coming to the Kennebunks. For his hotels, Harrington has frequently collaborated with interior designer Louise Hurlbutt of Hurlbutt Designs in Kennebunk, builder Kevin Lord of Thomas and Lord in Kennebunkport, and landscape architect Ted Carter of Ted Carter Inspired Landscapes in Buxton, and he went to the same team for his home. At first, Harrington renovated the second floor, creating an open living and dining space, master bedroom, and small guest room, and replacing existing finishes with randomly spaced painted planks for the ceiling, Ralph Lauren suede paint for the walls, and an appealingly textured wall-to-wall natural sisal rug for the floor. Built-in banquette benches and a dining table were added to one corner of the main room; an existing L-shaped kitchen island remained in another. Three years later, when the third unit became available, Harrington was able to renovate the entire house. He kept the upstairs intact, wanting a self-sufficient, cozy space, good for winter stays and summer privacy, but he redesigned the ground floor for family and friends. Now the downstairs consists of a large entryway with a reading nook, a great room (with living room, dining area, and kitchen), two small bedrooms, and a nautical bunkroom intended for Harrington’s nieces and nephews. Thomas and Lord completely updated the exterior with new windows, new cedar shingles and clapboards, and a rebuilt second-floor porch. The new windows capitalize on the water views, and the current layout encourages outdoor living, thanks to a new screened porch and a narrow new open-air porch with a bar that can be accessed through the kitchen’s mahogany bifold window. Where there had once been a parking lot with numbered spaces, there is now a fire pit of roughback stone surrounded by ornamental grasses, thanks to Ted Carter. 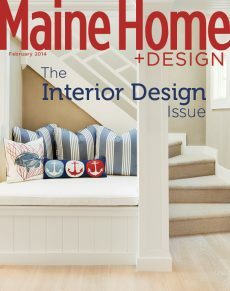 As for the interior, Harrington loves red, white, and blue, so these colors dominate the downstairs, in a flag from Harrington’s father hanging over the white living room couch, a red and white rug on the living room floor, and rattan chairs with blue cushions and white piping on the screened porch. The design impulse is cottage style with rustic, beach-influenced, or classically chic touches. These include barn board accents, floors of engineered white oak with whitewash, and white subway tile and gray Carrera marble for the kitchen countertops. The reclaimed wood that backs the kitchen’s open shelves is a dumpster-diving find, acquired from the work site of a home that two of Harrington’s Miami designer friends renovated in Cape Porpoise. Beyond these acquisitions, the home is filled with curious artifacts and belongings from Harrington’s previous residences, flea market finds like paintings and old mirrors, and direct purchases from Hurlbutt Designs. Books are everywhere, laid on shelves, piled on tables, filling the many built-in bookshelves throughout the house. “There’s nothing better than books as decoration,” Harrington says. “They warm up a room.” The books are so neatly aligned on tables and shelves they look like they might have been picked for size instead of content, but in fact Harrington is an avid reader. “I like everything,” he says. “I read a lot of Maine writers. I like mysteries. I love historical novels. Political stuff. Autobiography.” On a recent day, the only book that wasn’t neatly organized in his house was the one splayed open on his bed. “I like to sleep surrounded by books,” he says.